This Gingerbread Man Cookies Kit by Wilton includes everything you need to decorate 8 large gingerbread man (and/or gingerbread woman) cookies: prebaked gingerbread man cookies, icing mix, candy trims, and even fondant for accessorizing your gingerbread men cookies. Please allow 2-3 days for your order to be packed. Is This Kit a Gift? Want to send your kit as a gift? It's easy! Simply click here to open our Gingerbread Gift Request page and fill out the form. 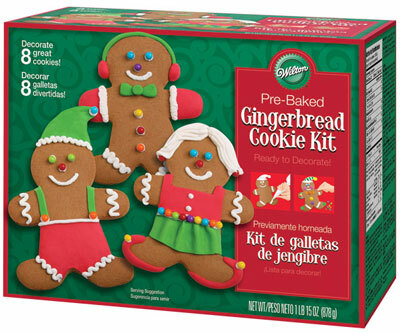 Click here to see more gingerbread kits. Return Home from gingerbread man cookies page.